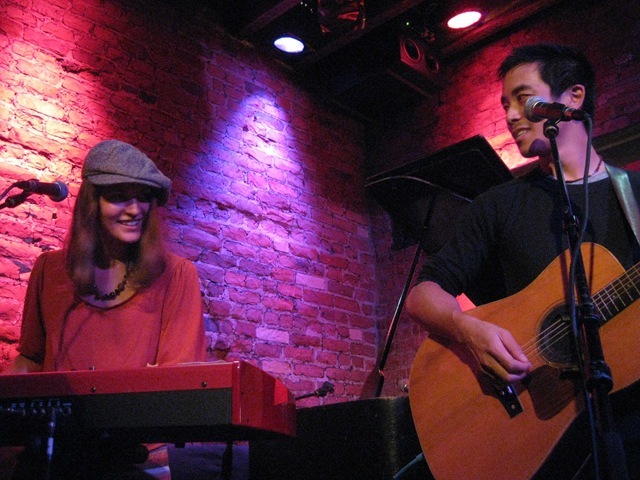 ambeR Rubarth and Alex Wong are two of the hardest working musicians in NYC’s vibrant indie music scene. Each has a number of projects going on simultaneously. They also regularly guest star at local shows with other indie rising stars. The Paper Raincoat is their collaboration project, an ingenious concept, telling a long-running story (a novel), unfolding song after song. 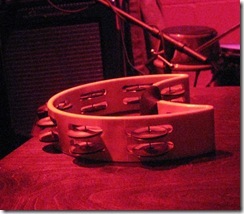 Of course, each song stands alone superbly on its own, making their music all the more delicious. For those who missed it, I first wrote about The Paper Raincoat in April. 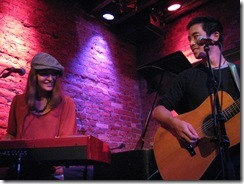 More recently, I wrote about ambeR Rubarth’s CD Release Party at Joe’s Pub. 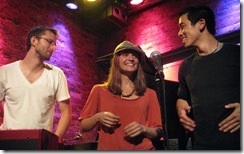 The Paper Raincoat is also having a CD Release Party at Joe’s Pub, on October 6th, at 9:30pm. We already have tickets, and I urge you to get yours soon, as there is little doubt that the show will sell out, and that it will be fantastic! 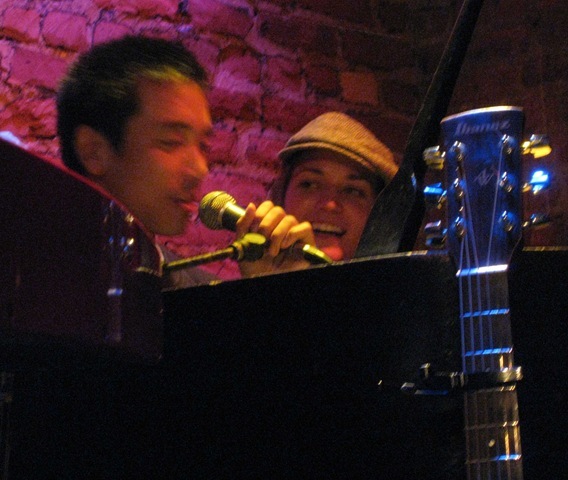 With that background, it should come as no surprise to find that ambeR and Alex joined in a new project last night, debuting at Rockwood Music Hall, called Cardboard Bikini. It was billed as a super secret show! Before you rush around the web, spending too much time figuring out that this was a wonderful tongue-in-cheek play on Paper (Cardboard) Raincoat (Bikini), I’ll spare you the trouble, by sharing my perspective on why they did this at the end of the post (I have zero insight from them, just my speculation). 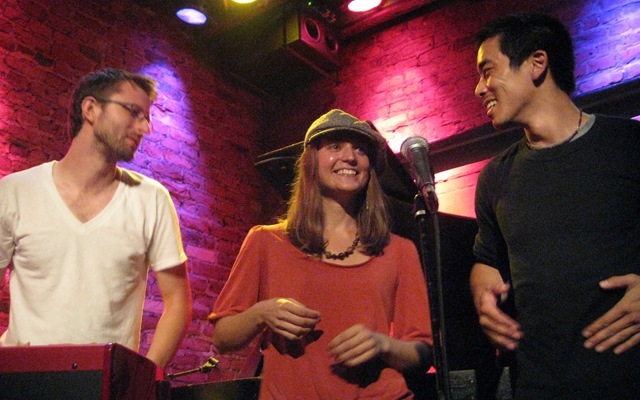 All shows at Rockwood are free, and the vast majority last an hour. One drink minimum per person is required, and for some shows, a tip bucket is passed around at the end (last night included, most people donated, along with us). Joining ambeR and Alex last night was Adam Christgau on drums, just as he did at the Canal Room show where we discovered them. Just like at that show, Adam was awesome last night. 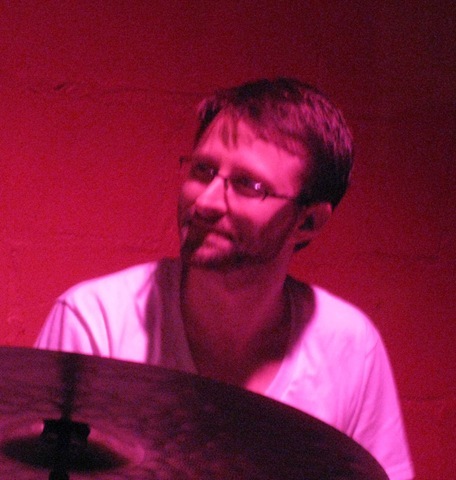 I am always impressed when a drummer can play it just right for the size of the room they’re in, and given the teeny size of Rockwood, Adam managed a very large sound, without ever stepping on ambeR or Alex. They opened the show with two of their hits, Brooklyn Blurs and Sympathetic Vibrations (two songs we can’t get enough of!). They played a few other songs that we’re familiar with, but in the middle of the set, they debuted (at least for us) a couple of songs that were fantastic. This included a song called Right Angles, where both Alex and ambeR play the grand piano simultaneously, meaning, four handed! Wonderful! They closed the show with the same two numbers that they closed Canal Room with, and we can only hope that they do it again at Joe’s Pub, because they bring the house down every time. 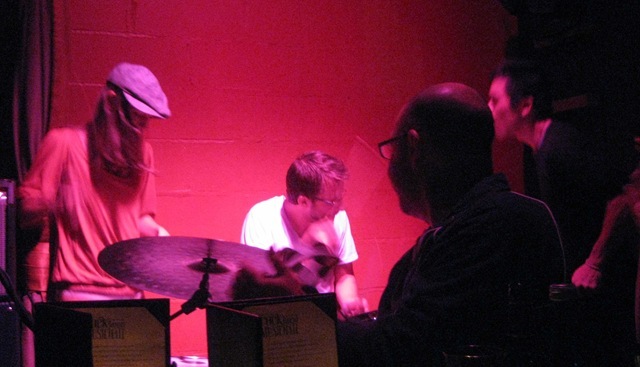 On the first one, all three end up drumming on Adam’s drum set at the same time. It’s incredible. 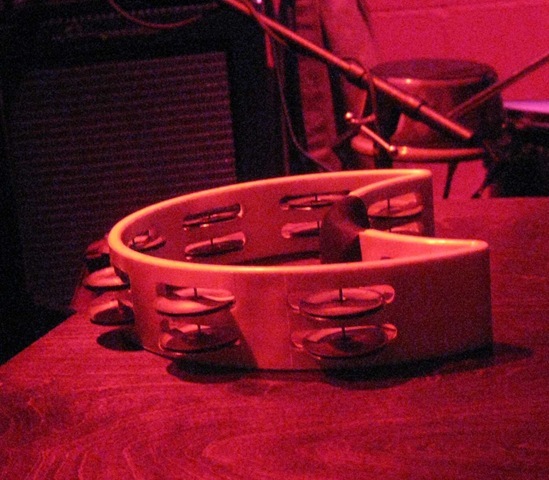 At Canal Room, Lois was the designated tambourine player. 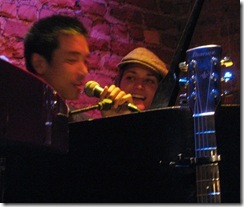 Last night, a wonderful NYC musician named Adam Levy (I covered him in the ambeR post) had the honor. The only disappointment was that setting up on the tiny stage required more maneuvering than normal, and it took them longer to finish the setup than they anticipated. So, instead of the show starting at 10pm as scheduled, they started playing at 10:25pm. They played over their 11pm limit (by 11 minutes), to make up a bit of it, but otherwise, an amazing evening. The official CD Release Party is October 6th, and they wanted a way to test out some of the new material live, in anticipation of the Joe’s Pub show, without the pressure of formally debuting it as Paper Raincoat. They have a great sense of humor, and the whole concept of a top-secret, not-so-secret show, with a clever name, appealed to them for no other reason. Come see them at Joe’s Pub on October 6th, and buy the new CD there (you won’t regret it). Also, consider signing up for the mailing list and getting the announcement for pre-orders. That’s always a great way to support a band that you like! Hope to see you there!